The Channel Islands' leading table tennis players are to be given a chance to perform on the world stage in front of Sky Sports cameras. The World Championships of Ping Pong is a creation of the legendary snooker and boxing promoter, Barry Hearn, and the next event will have a CI representative in the 64 players from across the world to compete in the $20,000 live event at Alexandra Palace. Entries are now being taken for the Ravenscroft-backed CI Championship which will be staged at the GTTA Centre on Saturday 15 November. GTTA president Derek Webb, who expects the leading players in the islands to put themselves in line for the title and world qualification, came forward with the idea after meeting the main organiser. 'When I watched this tournament on telly last year and saw players from the other home countries I thought how can Guernsey get involved,' he said. 'I made some enquiries to the main organiser [Fred Dove], who is crazy about the tournament, and after several discussions he has allowed us to have a qualifying tourney for the Channel Islands. So we will definitely have a representative from one of the islands. 'I am really excited that we are part of this annual event and someone will have an opportunity to win the $20,000 on offer for the winner. The event is only open to 64 players and they all have to qualify somewhere.' 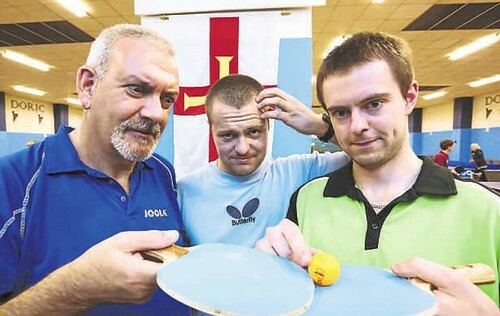 The inaugural CI championship for this fast and furious back-to-basics version of table tennis will be staged in one day with Webb keen to introduce a number of different aspects to the event, which will see the winner take home £200, as well as his/her travel to the London event paid for. 'With our great friends at Ravenscroft supporting the event it is going to be a table tennis extravaganza,' added Webb. 'What is unique about the event is all players use the same equipment [sand paper bats] which makes it a level playing field. 'We are hoping to attract 32 players from the islands to this unique event and are offering prize money for the qualifiers'. The format will be four groups of eight with the top four of each group going through to the knock-outs and the final stages on the show table. Below: Looking quizically at their sandpaper bats which will be used for the World Ping Pong qualifier here. Left to right, local hard bat specialists Charlie Elliott, Garry Dodd and Paul Hainsworth, who are expected to be among the 32-strong entry next month.